On Colorado Blvd. in Old Town Monrovia, Sunday May 1st, from 2pm to 8pm. Featuring Latino Art, Music, Dance, Culture and...this whole family friendly celebration is free! There will be a lot going on for this event, but the music alone is enough to make this one of my favorite Monrovia events. All the musicians are so good and so talented but when you can get Kid Ramos and Los Fabulocos and The Delgado Brothers into town to play shows that are free to see, trust me, you don't want to miss this. Monrovia, CALIF. (April, 2011) - Monrovia’s Cinco De Mayo Cultural Art and Music Festival will take place on Sunday, May 1, 2011 at Colorado and Myrtle Ave in charming Old Town Monrovia from 2PM to 8PM. The all-day celebration will transform the city streets into a festive block party with educational and cultural exhibits, musical performances from Grammy-award winning entertainers. In addition to an array of dance performances from popular Folklorico and Oaxacan dance troupes. The event is free and all ages are welcome. Over 5,000 people are expected to attend this inaugural free, family-friendly block party making it San Gabriel Valley’s largest Cinco de Mayo celebration and the first event in Monrovia’s 125 year’s of existence to pay tribute to Latino heritage. Monrovia will join over 100 US cities celebrating the rich culture, heritage, and history of Mexico. The event is a community led effort comprised of over a dozen person committee and led by Committee president Rudy Castrellon to pay tribute to the history and contributions that the Latino community has made to the City of Monrovia. “I invite everyone to Monrovia to be part of history,” says Castrellon President of Monrovia Cinco De Mayo Committee and local business owner. The event kicks off with performances from CaliMex roots quartet Los Fabulocos, and popular Latin Jazz ensemble the Banda Brothers. The fiesta continues at the children’s stage where Folklorico and Oaxacan dance troupes will perform into the early evening. Throughout the celebration, attendees can enjoy works from over 75 local artists displaying a variety of media including: watercolor, oil painting, photography, ceramic, and glasswork. Visitors can also sample popular Mexican fare from a variety of Monrovia restaurants including Rudy’s Mexican Food Restaurant participating in the event. The event continues with special performances from the wildly popular Delgado Brothers performing their Latin infused blues. The cultural and arts festival will culminate with a very special performance from the Grammy Award winning group The Mariachi Divas, a unique, multi-cultural, all female mariachi ensemble. 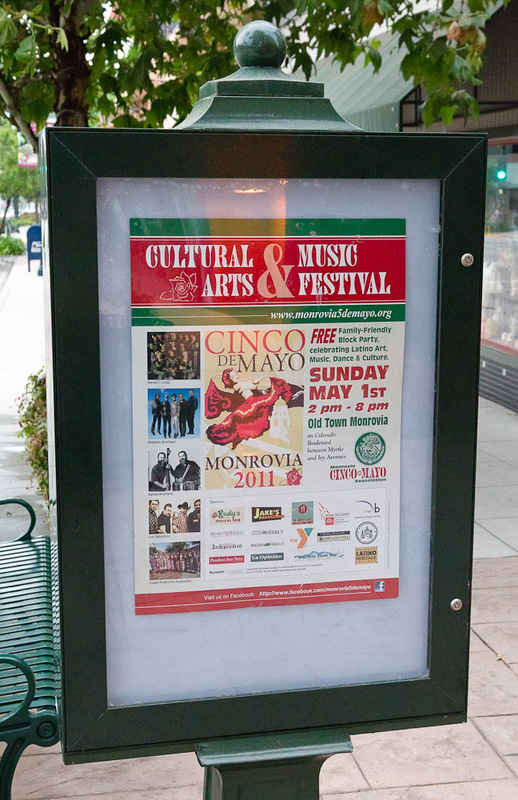 The Monrovia Cinco De Mayo Cultural Art and Music Festival is produced by the Monrovia Cinco de Mayo Association in partnership with the Nuvein Foundation for Literature and the Arts, a 501 (c) (3) non-profit organization whose mission is to celebrate the diversity that is Monrovia, and to promote an understanding of all peoples and their cultures.